Instant pot breakfast recipes make the morning go so much more smoothly. When you want a satisfying change from oatmeal, a warm bowl of chocolate covered strawberry breakfast quinoa will most definitely hit the spot. Look forward to waking up to a bowl of naturally sweetened goodness that not only offers the taste of chocolate and strawberries but is also full of protein. Add a splash of vanilla to enhance the flavors of all the ingredients even more. I had the pleasure of meeting the lovely Erica from The Crumby Kitchen at a food bloggers conference this past week. 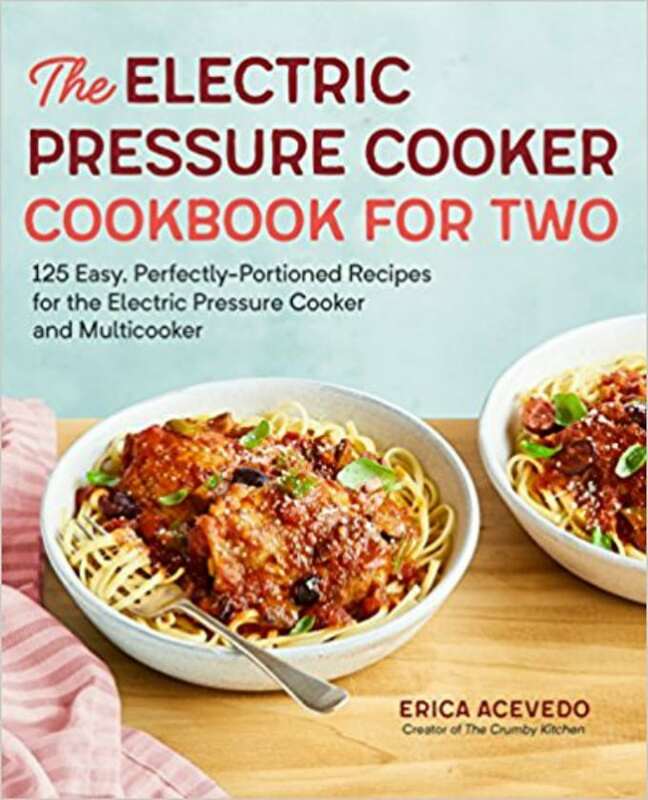 What made it so exciting was that I have been online friends with Erica for a lonnng time, and have even helped recipe test for her new cookbook The Electric Pressure Cooker Cookbook For Two, but had never actually met her in person. Erica is lovely, and her book is just packed full of amazing recipes (125!! including this instant pot breakfast recipe) for you to whip up in the pressure cooker. Now, you are probably wondering why someone with a husband and three children would be interested in a cookbook sharing recipes for 2?!? I have one word for you: breakfast. My kids are like little starving monsters that must be fed immediately upon falling out of bed. They want breakfast like 5 minutes ago as soon as they roll out of bed. My hubby on the other hand practices intermittent fasting these days and doesn’t want to even look at food until around 10am. And me? I can’t eat until I have at least coffeed and showered. So this section has become my new best friend. I pop breakfast for the kids into the pot, walk away and have my shower, and by the time I have finished, the monsters have awoken and the pot is beeping with delight. Goals! The dinner recipes have been great when hubby is out of town. And even on an ordinary night, we try to keep our meat consumption down and veggie intake up, so recipes like the Carnitas Tacos with Avocado Crema (one of our fav recipes from the book) have made more than enough for our family of 5 when fleshed out with some extra veg and a grain. Don’t worry, I’m not going to tell you all about the book and then leave you hanging, of course I have a copy to giveaway. Just leave a comment telling me your favorite thing about using a pressure cooker and you are in with a chance of snagging your very own Hardcopy of The Electric Pressure Cooker Cookbook For Two! Good luck. Thoroughly rinse the quinoa in a mesh strainer for 2 minutes, using your hands to sort through and pick out any discolored pieces or pebbles. Put the quinoa in the bowl of your cooker and stir in the coconut milk, water, maple syrup, cocoa powder, vanilla (if using), and salt. Seal the lid with the vent shut and press the button for the rice setting to cook on low pressure for 12 minutes. Allow the pressure to naturally release, about 10 minutes, then open the vent at the top and remove the lid. Flu the quinoa with a fork and spoon it into two cereal bowls. Add more coconut milk, and top with strawberries and chocolate shavings. For a unique and indulgent chocolate flavor, swap out the cocoa powder for your favorite chocolate-hazelnut spread and add crushed hazelnuts on top. I love breakfast quinoa, but I’ve never cooked it in the pressure cooker! So convenient. The chocolate covered strawberry theme for this breakfast bowl is making me hungry, too! Such a great treat to start the day that feels indulgent but is really good for you! I love Erica and I love my IP so – match made in heaven, right? This sounds like such a tasty and satisfying breakfast and so nice to change things up from the usual! Can’t wait to try it! This recipe sounds amazing! 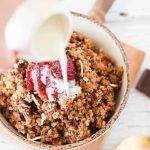 Love quinoa and all its benefits and the chocolate and strawberries brings it to a new level of deliciousness. 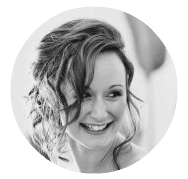 I am ordering a copy of Erica’s book – love it! What a great change from oats in the morning! Quinoa sounds like a great idea? It’s all about how you flavor it. And I’m all about healthy chocolate with whole grains for breakfast. Or is it healthy wholes grains with chocolate? Either way, I have to check out this cookbook! Chocolate covered strawberries for breakfast sound perfect to me! 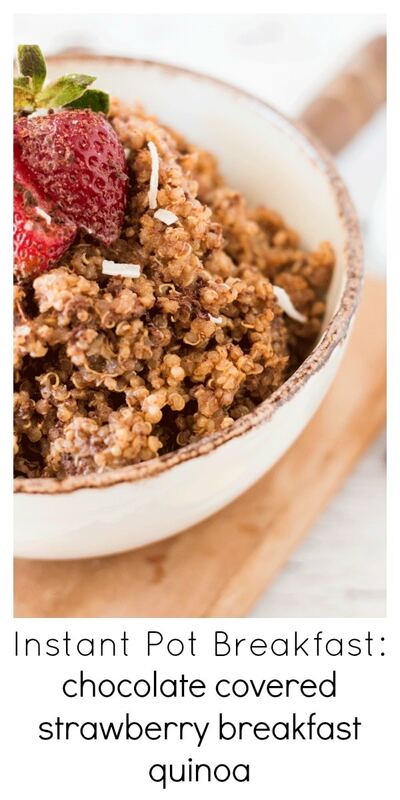 I love the idea of sweet quinoa for breakfast. Better yet, if I can make it in my IP! You had me at chocolate and strawberry. Seriously those two flavors will always win me over. We are a gluten free family, so this quinoa breakfast is a great idea. I love packing as much nutrients as possible into breakfast and this recipe sounds like the perfect flavorful way to do that. Plus I am a sucker for anything made in a pressure cooker. You already had me sold on “Chocolate covered strawberries”. Then, I don’t think Ive ever seen Quinoa used in a sweet way like that but it makes so much sense! It is such a clever idea to replace oats, muesli or chia. WOW…just printed this recipe off. The grandkids will be here 2 days a week for the summer. I know this would be a welcome breakfast….in fact I just might have to make it this weekend and test it out. Won’t gramma be a hit when she serves them chocolate for breakfast!! First, let me say that this cookbook sounds perfect for me. 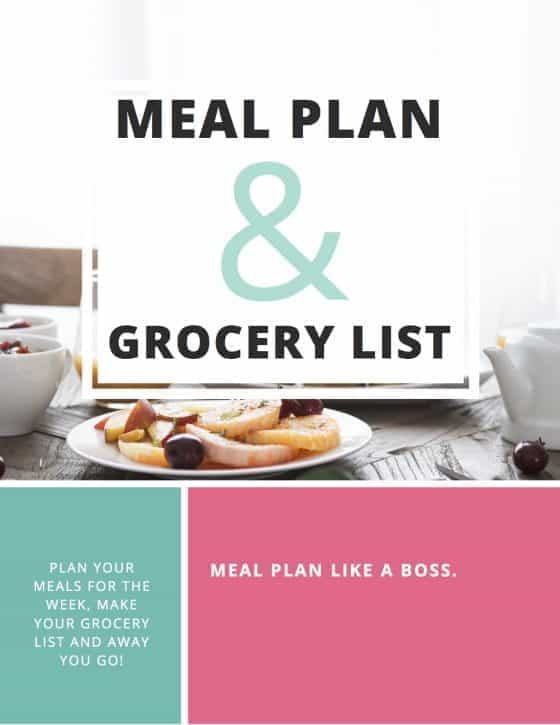 My daughter has just graduated from college and is trying to start her career (away from home)… So my husband and I are the only 2 in the house — but this would also be great for my daughter — because she could cook for one — with leftovers for later. I love my pressure cooker, especially for taking long-cooking items like beef stew and turning it into a 30 minute meal. I’ll be honest though — quinoa in the pressure cooker is new to me — newer still chocolate quinoa for breakfast. That’s a revelation! This looks great! I haven’t used my IP as often as I’d like, but I love the functionality, especially being able to both sauté and pressure cook in one pot! I haven’t tried the instant pot for breakfast yet! So far I just use it for pork wonton bowls and hard boiled eggs lol. I’ll be following the blog now!! I never thought to eat quinoa for breakfast for some reason. This looks great, especially the strawberries and cocoa powder combo, very clever. I’m always game for a healthy breakfast, I would have to cook on the stove top though. I don’t have a pressure cooker. Thanks for sharing this recipe!